What is a Hand Foot Mouth Disease (HFMD) ? A new epidermic disease involving the young children has arrived again at our doorstep in Malaysia. This trend was detected for the last 02 consecutive years and apparently, it has started to come back again at this moment, incurring a fast increase of young children. 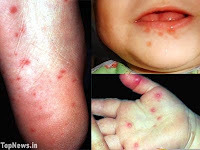 [Hand, foot, and mouth disease (HFMD) is a common illness of infants and children, caused by a virus. It most often occurs in children under 10 years old. It is characterized by fever, sores/ulcers in the mouth, and a rash with blisters. The blisters may appear in the mouth, palms of the hands and soles of the feet. The rashes may also appear on buttocks and on the legs and arms. The ulcers in the mouth usually appear on the tongue, the sides of the cheeks, gums or near the throat. The most common causes of Hand, Foot and Mouth disease are coxsackie virus A16, enterovirus 71 (EV71) and other enteroviruses. The enterovirus group includes polioviruses, coxsackieviruses, echoviruses and other enteroviruses. HFMD begins with a mild fever, poor appetite, malaise ("feeling sick"), and frequently a sore throat. One or 2 days after the fever begins, painful sores develop in the mouth. They begin as small red spots that blister and then often become ulcers. They are usually located on the tongue, gums, and inside of the cheeks. The skin rash develops over 1 to 2 days with flat or raised red spots, some with blisters on the palms of the hand and the soles of the feet. A person with HFMD may have only the rash or the mouth ulcers. Hand, foot and mouth disease is usually diagnosed based on a complete history and physical examination of your child. It is generally suspected on the appearance of blister-like rash on hands, feet and mouth in children with a mild febrile illness. Usually, the doctor can distinguish between HFMD and other causes of mouth sores based on the age of the patient, the pattern of symptoms reported by the patient or parent, and the appearance of the rash and sores on examination. A throat and/or blister swab collected preferably within 2 days of onset of HFMD may be sent to a laboratory to determine which enterovirus caused the illness. Presently, there is no specific effective antivirul drugs and vaccine available for the treatment of HFMD. Symptomatic treatment is given to provide relief from fever, aches, or pain from the mouth ulcers. Dehydration is a concern because the mouth sores may make it difficult and painful for children to eat and drink. Should their affected children be having fever, the parents are advised to dress their children in light, thin clothing, to do tepid sponging with water (room temperature) as often as necessary, and to expose them under the fan. Taking enough liquids is very important apart from body temperature monitoring. HFMD occurs mainly in children under 10 years old, but may also occur in adults too. Everyone is at risk of infection, but not everyone who is infected becomes ill. Infants, children, and adolescents are more likely to be susceptible to infection and illness from these viruses, because they are less likely than adults to have antibodies and be immune from previous exposures to them. Infection results in immunity to the specific virus, but a second episode may occur following infection with a different virus belonging to the enterovirus group. Parents must make sure their children practice a good health care. Wash hand before having food, have shower after play outside and bring your children seek for doctor when they are ill. Be alert at all time in any circumstances and most important make sure our residential are clean]. What type of species is this ? Happened to come across this strange wild flower while I went jungle trekking with my wife on the 05th of February 2012. This is indeed a strange looking plant which I have never seen before. Strange enough, there is no smell emitted from the centre stem. I heard about its other variety which will emit a strong stench and also will attract a lot of flies. I was very fortunate to communicate with a Master Gardener who told me that this plant is also known as "Amorphophallus Bulbifer" and this is a variety which can only be found in a tropical jungle. It is said that the flower will bloom and will usually lasted for a week before it died again. If the plant is properly taken, it might grows up to a height of 6 - 7 feet tall. True enough, the flower withered after 07 days (see below). It was a sad moment when we saw the condition of the flower. We even went to pay another visit today, soaked in the rain. Anyway ..... Go and Rest in Peace until you bloom again !!! What is Hammertoes, or Mallet toes ? The cause of wearing improper footwear. Shoes that are too tight in the toe box, or shoes that have high heels should be avoided. Wearing shoes of either type can push your toes forward, crowding one, or more of your toes into a space that's not large enough to allow your toes to lie flat inside the shoes. Hammertoe and mallet toe deformities can also be inherited too, and may also occur even when wearing appropriate footwear. The physical appearance of such toe appears to bend upward in the middle and then, curls down in a hammer-like, or claw-like shape. Your shoes can rub against the raised portion of the toe(s), causing painful corns, or calluses due to frictions. The bottom of the affected toe can press down, creating the mallet-like appearance. Initially, such toes may maintain their flexibility and lie flat when you're not wearing crowded footwear. But as time goes on, the tendons of these toes may contract and tighten, causing your toes to become permanently stiff. Eventually, these affected toes might overlap each other and pushing toward the direction of the big toe. If the pain is too intense (either when wearing shoes, or when walking barefooted), surgery is the only mean to resolve such problem. I had a friend who had his 2nd toe surgically cut-off recently and what a relief when the pain has finallygone, as the other toes were now able to occupy the newly-found empty space.